Ellerbe Road United Methodist Church in Shreveport recently made a donation of $2,000 to the Northwest Louisiana Veterans Home located in Bossier City. The donation, the second the church has made to the veterans home, comes from funds the church raises through monthly “Cook’s Night Off” suppers. Held on the first Thursday of each month, the suppers started out as a community project and were not expected to generate funds. But when the church began to make money on the meals, church members chose to donate the proceeds to support local veterans. Several of the members had family or friends being served by the Bossier City veterans home. They were very impressed by the level of services provided, so the facility was chosen to receive the funds. 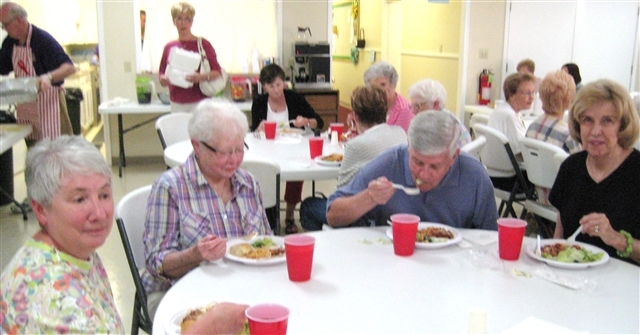 The spaghetti suppers are held from 5-7 p.m. at the church, located at 10130 Ellerbe Church Road. For additional information, call the church office at (318) 797-8608.